Like HOMAGO, Affinity Online is a multi-year, multi-investigator effort, grounded in ethnographic case studies of youth online engagement. It offers a textured and in-depth look into a delightful diversity of youth online affinity networks—Harry Potter fans who knit together, professional wrestling and One Direction fan fiction writers, Starcraft II esports aficionados, Nerdfighter activists, anime video remixers, Little Big Planet level makers, and Bollywood dancers. Most importantly, the book identifies underlying patterns in how these affinity networks are held together, organized, and fuel connection and learning. These affinity networks are characterized by shared culture and purpose, and ways of marking positive forms of status and achievement. By doing so, they support young people in connecting with like-minded peers, giving and getting feedback, creating epic productions, amassing audiences, solving complex problems, and sometimes even making a living. While sharing a similar methodological approach, Affinity Online differs from HOMAGO in some important ways. Where HOMAGO was a broad scan of the varied shapes and flavors of youth online activity, Affinity Online is a focused dive into what HOMAGO described as “interest-driven” forms of online participation which differs from the majority of youth online activity which is “friendship-driven.” Unlike the friendship-driven hanging out over popularity and romance with kids from school, interest-driven activity is about diverse geekdoms and special interests which may not be shared with kids from school. 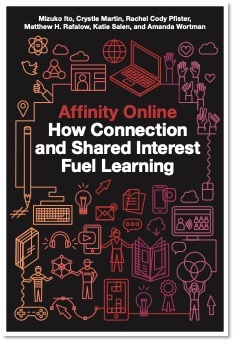 With Affinity Online we chose to take a highly selective look into interest-driven groups that could provide a bridge to connected learning. It was not a scan of a typical or representative youth online affinity networks. Instead we were inspired by the “positive deviance” methodology from public health, where researchers look for promising but non-mainstream practices within existing communities. We looked specifically for online affinity networks that enlisted diverse youth and interests, and were connected to academic learning, civic engagement, and career opportunity. Nobody these days would be so foolish as to suggest that the internet is all rainbows and unicorns. But now more than ever it’s important to find the unicorns and amplify their visibility and influence. Affinity Online is about those positively deviant youth online activities that can inspire the internet to be better. The online affinity networks we look at share similarities with more familiar kinds of interest-driven youth learning, such as sports, chess, music, or visual arts. At the same time, we highlight some key limitations of digital interests that depend on online networks. The biggest challenge is a persistent digital generation gap. Despite their positive potential for learning and youth development, most adults are at best indifferent and at worst actively hostile to youth digital and popular culture such as gaming, boybands, and anime. Unlike more traditional interests, digital interests are rarely sites of intergenerational connection. And kids like to keep it that way too. The last thing young people want is for parents and teachers who don’t get it to try to be hip to online fandoms and games. This digital generation gap means that even though kids are learning tons of skills—academic, leadership, and socioemotional—very rarely does this learning connect to school or careers. Unless they come from tech or “creative class” backgrounds, parents and teachers aren’t sitting in the bleachers cheering their Starcraft players on, or admiring a well-crafted piece of boyband fan fiction. The kids who are parlaying their engagements in online affinity networks to grown-up world recognition are still a small digital elite. So how can we tap into the positive learning that is happening in online affinity networks? The big lesson for parents and educators from Affinity Online is that a little bit of connection goes a long way. Long accustomed to getting disdain and eye rolls from adults about their digital interests, young people have come to rely on their online networks to find others who get it, offer meaningful feedback, and celebrate their achievements. But when an adult takes the surprising step of acknowledging and supporting a digital interest and connecting it to a new opportunity, the results can be life changing. Maria, a young woman who developed a passion for writing in her WWE fandom confided in a teacher, who encouraged her to write for the school newspaper, and eventually pursue a major in technical writing. Amy, who knits Harry Potter themed creations as part of the online community, Hogwarts at Ravelry, set up an online site selling her patterns with the help of her father. Day9, a competitive esports player, had a mother who supported him in attending national competitions, and he eventually went on to a career as a successful esports commentator. These are just a few examples of how parents and educators connected with young people’s digital interests in lightweight but impactful ways. Other educational groups have made a more sustained effort to connect youth online affinity networks to learning opportunities. The Scratch online community offers a supportive, intergenerational community for young people to connect with one another online around coding and digital making. Connected Camps, a nonprofit founded by two of the book’s authors (Katie Salen and myself), has developed online programs in Minecraft that connects kids’ interest in the game with coding, engineering, and digital arts. The North America Scholastic Esports Federation is a network of high schools supporting esports clubs and competitive leagues across the country. These are just a few examples of efforts connecting the enthusiasm, initiative, and learning of youth-driven digital interests and online affinity networks to educational, civic, and career opportunities. We hope that Affinity Online can offer a glimpse into the latent power of young people’s online activities to inspire more such connections.